Time to Pack the Pantry! 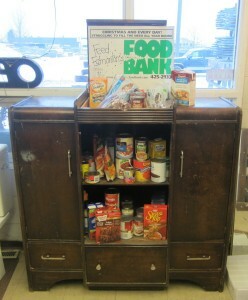 Once again this year we are collecting donations for the Edmonton Food Bank with our Pack the Pantry event! Thanks to your generosity in past years we have made significant contributions to this cause. It’s this display of community spirit that makes Edmonton such a wonderful city in which to live and work! If you’re coming down to browse or shop with us soon, please join us again in supporting this wonderful organization by bringing a non-perishable offering.